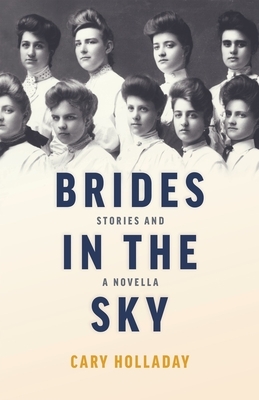 Each of the crystalline worlds Cary Holladay brings us in the short stories and novella that make up Brides in the Sky has sisterhood, in all its urgency and peril, at its heart. In the title story, two women in 1850s Virginia marry brothers who promptly uproot them to follow the Oregon Trail west, until an unexpected shift of allegiance separates the sisters forever. Elsewhere in the book, a young boy’s kidnapping ignites tensions in a sorority house; frontier figure Cynthia Ann Parker struggles upon her return to her birth community from the Comanche people with whom she’s lived a full life; and in a metafictional twist, a gothic tale resonates in the present. In the novella, “A Thousand Stings,” three sisters come of age in the 1960s over a long summer of small-town scandal and universal stakes. These are just some of the lives, shaped by migrations, yearning, and the long shadows of myth, that Holladay creates. She crafts them with subtle humor, a stunning sense of place, and an unerring eye for character. Cary Holladay has published seven volumes of fiction, including The Quick-Change Artist,Horse People: Stories, and The Deer in the Mirror. Her stories and essays have appeared in Ecotone, Epoch, Georgia Review, Hudson Review, Kenyon Review, Oxford American, Prairie Schooner, Shenandoah, Southern Review, Tin House, Virginia Quarterly Review, and many other journals. Her story “Merry-Go-Sorry” was selected by Stephen King for an O. Henry award. She teaches at the University of Memphis.